Eleven year-old Natalia Marsh-Welton had a mission. Not even terminal brain cancer was going to stop her. 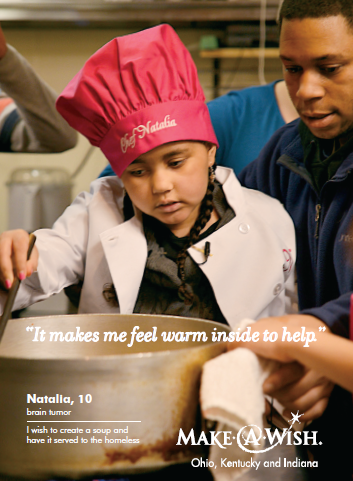 Natalia was determined to help the hungry and homeless. She said, "I would like to give people soup and blankets. I don't want there to be hunger." On her birthday this October, Natalia and her loving family went to the Drop Inn Center in Cincinnati, Ohio. The Center provides food and shelter to the homeless. There they handed out blankets and served a soup Natalia had prepared. This was a continuation of Natalia's mission started earlier this year thanks to the Make A Wish Foundation. Her first wish to the Foundation was for the cancer to go away. She also knew how cold she would feel after getting chemotherapy and that inspired her to help the homeless. She could relate to their suffering. That is when she came up with the idea for giving out soup and blankets. Natalia worked with a local chef to come up with a special recipe for her soup. It is called Natalia's Soup of Love. The soup has not only fed the hungry in Cincinnati but also miles away in Louisville, Kentucky. Last week Natalia passed away from her brain tumor. Her spirit and mission will go on. Her family is going to celebrate her birthday every year at the Drop Inn Center. They will continue to help those in need. Natalia put others ahead of herself, even in her most troubled times. To her love and sharing were what life is about. If there were more Natalias in the world, we could virtually wipe out hunger. Everyone would have a roof over their head. What are some ways to help keep Natalia's mission going? Just getting involved with your local food bank and agencies that fight world hunger are great ways to start. If you visit the Feeding America web page you could locate the food banks and shelters in your area. There you will find ways to help out whether by volunteering, donating or advocating. If you visit the World Food Programme's web site you can find ways to get involved fighting hunger on a global scale. There are 805 million people worldwide who live in hunger and struggle to get one meal a day, if they are fortunate. Natalia's family needs help too as they have fallen upon difficult financial times. They have set up a GoFundMe campaign to help pay the medical bills. As winter arrives, a little bit early, we can take some comfort that homeless people have blankets because of Natalia. They have and will continue to eat her soup. They will not go hungry. The recipe for Natalia's Soup of Love is available online. The upcoming holiday season is a time of giving. Natalia took that one step further and made it a year round season. Natalia is an example to everyone. She gives us hope that we can make a better world. We can end hunger and homelessness. We just need to have her courage, creativity and spirit with us on that road to peace.